As the country prepares for the landfall of Typhoon Ruby (Hagupit), here are some resources to help people stay abreast of disaster and emergency information. 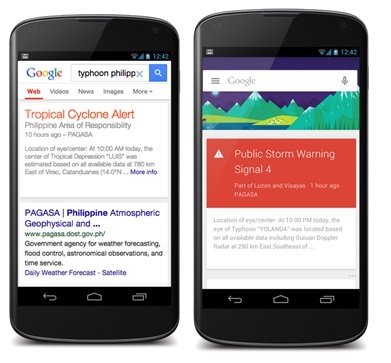 Google Public Alerts is a one-stop page that carries information from the Philippine Atmospheric, Geophysical and Astronomical Services Administration (PAGASA) including storm location, strength, movement, forecast positions, recommended actions, and related real-time Twitter posts from government agencies and the media. The alert is also automatically displayed on Google Search, Google Maps, and Google Now depending on search query and location. Google has also put up a crisis map with details on evacuation centers, tropical cyclone forecast track, clouds imagery, and traffic alerts from Waze users. The crisis map can be embedded to any website to facilitate faster access. According to PAGASA, Typhoon Ruby may hit Eastern Samar by Saturday morning and South Southwest of Romblon by Sunday morning. Public Alerts– real-time updated information from Pag-asa and other information on the typhoon and its route and expected effect. Google Crisis Map – for Ruby. This map contains information on shelters, evacuation centers, and the track of the cyclone. Crisis Landing Page houses our Person Finder and a lot of emergency contact numbers. To programmatically add your missing persons lists with Google without having to type them one by one on Person Finder, or search from the Google repository, you can use the API. Our engineers in other countries are on standby for your key requests. Please be patient as we answer all requests. We expect this to be a long queue.